The interior of the Sandia Wave Energy Power Take-Off (SWEPT) Lab. 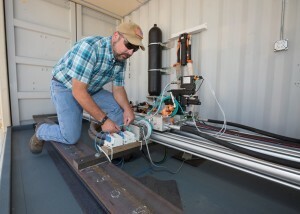 Designed specifically for testing WEC PTOs by control systems experts in the Sandia Water Power Technologies department, the SWEPT Lab adds value to researchers and industry by providing specialized methods and facilities for WEC PTO design and testing. 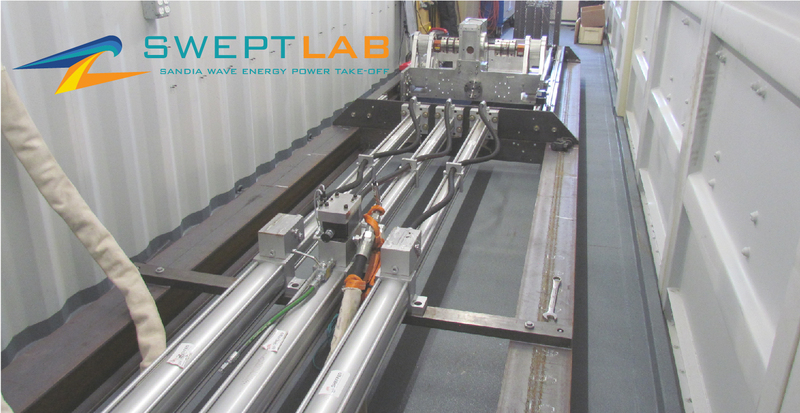 The SWEPT Lab is a mobile system that can test wave energy power take-offs at the most convenient location. The SWEPT Lab uses hydraulic machinery to simulate the input from the ocean waves (including wave forcing and WEC hydrodynamics), allowing for hardware in-the-loop (HIL) testing of PTO systems for system identification (SID), real-time control, reliability analysis, and grid interface analyses. At the SWEPT Lab, rotational and linear WEC PTOs can be tested independently or in parallel in order to simulate an array of devices. PTOs with power between 5 and 500 kW (5 < P < 500kW) and frequencies up to 2 Hz (0 < f <2) can be tested using the lab’s large-scale hydraulic actuators and modular systems. A series of linear actuators—the largest with a net stroke of 4 meters—is available to allow for testing of PTOs from model-scale through ocean-deployed systems. The SWEPT Lab also includes high-performance real-time computing hardware for performing HIL analyses, including array analyses and grid modeling. 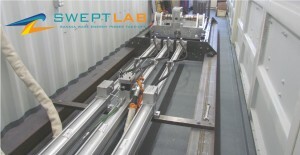 The SWEPT lab can test multiple degrees-of-freedom with independent control. It simulates the dynamics (inertia, damping, stiffness, multi-body links) of full-scale WECs, as well as the input from waves and wave-body interactions. G. Bacelli, S.J. Spencer, D. Patterson, R.G. Coe, “Wave tank and bench-top control testing of a wave energy converter,” Applied Ocean Research, in-press. G. Bacelli, S. J. Spence, R. G. Coe, A. Mazumdar, D. Patterson, and K. Dullea, “Design and bench testing of a model-scale WEC for advanced PTO control research,” in European Wave and Tidal Energy Conference (EWTEC), Cork, Ireland, 2017. Simone, C. Costello, G. Bacelli, R.G. Coe, “Hydraulic PTO model emulator for WEC tank tests,” in Proceedings of SPEEDAM2018, Amalfi coast, Italy, 2018. Our highly-professional personnel offer technical expertise and research experience to develop solutions to challenges faced by the water power industry. Contact us to learn more about the lab or how to work with us.